Now that is not an unusual question to be asked of someone like me, a comics professional and writer about comics for well over forty years. What is unusual was that I was asked the question at G-Fest, a glorious Godzilla convention, and PulpFest, a terrific gathering of pulp magazine collectors. As I’ve been saying for some time now, even people who don’t follow our beloved comic books closely have a familiarity with them. Even if that familiarity comes from news and other mainstream sources. My familiarity with Rebirth comes from having read the first month of the involved titles. I don’t often read news articles or opinion columns on things I’m likely to read. I suppose I could ask my new friends at DC Entertainment to explain Rebirth to me…and I might do that soon…but, here, I’m going it alone. DC Universe Rebirth strikes me as a soft reboot of the DC Universe most recently represented by “The New 52.” Some unknown person has been playing with reality. What we have at the moment seems to be a DC Universe which has some elements of the traditional universe and some of “New 52″ universe. I find this interesting. I want to see how it all shakes out. There also seems to be a more optimistic atmosphere to the Rebirth titles. As I have always felt the super-hero genre is, at its very heart and soul, an optimistic one, that’s a good way to convince me to buy and read these comic books again. DC Universe Rebirth #1 [$2.99] kicked off this new chapter for the Universe. 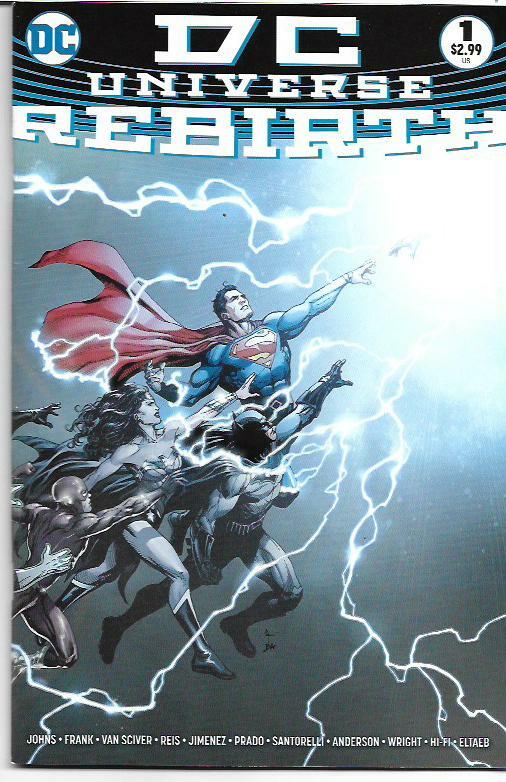 It was written by Geoff Johns with stunning art by Gary Frank, Ethan Van Sciver, Ivan Reis and Phil Jimenez. 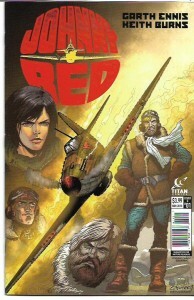 It contains 63 pages of story and art, which, at today’s comics prices, is a great buy for three bucks. I’m not going the review route per se this week, but I will touch on some of the appealing and/or interesting things in the issues I have read. Most of these issues have gone into multiple printings, so they shouldn’t be too hard for you to track down. There seems to be a link to Watchmen, the landmark limited series by Alan Moore and Dave Gibbons. I surprised myself by being pretty much okay with this. Moore seems to have divorced himself from the property completely and Gibbons, who seems a mite miffed about this possible use of the characters, was okay with the Before Watchmen comics of a couple years back. I think what convinced me not to be upset was a comment from Marvel’s Tom Brevoort. While agreeing the original Watchmen series was complete unto itself, he said that if Marvel had owned the property, they probably would have brought the characters into the Marvel Universe a decade ago. “Everything you thought you knew is a lie” is a common and seldom completely truthful come-on for super-hero stories. However, in the case of DC Universe Rebirth. It does appear a great deal of what we (and the heroes) know about the “New 52″ universe was a lie or, at least, a manipulation of reality. Wally “Kid Flash” West is back. A very old Johnny Thunder is screaming for his thunderbolt. Ryan Choi may be back as the Atom. Someone with a Legion of Super-Heroes ring is looking for Superman. The young Blue Beetle is working with Ted Kord. Green Arrow and Black Canary, who barely knew each other in the “New 52,” feel a connection with one another. And someone is watching our world with Batman knowing something is going on that isn’t right. I’m intrigued. In Batman Rebirth #1 [$2.99] by writers Scott Synder and Tom King with artist Mikel Janin, Batman seems more sane than he has in too many years. I like that. Duke, the “Robin” whose parents remain in a mental hospital due to their exposure to Joker gas, is coming to work for the apparently integrated Bruce/Batman and not as another Robin. I like that. And there’s also a positively unsettling take on the Calendar Man. I like that, too. I’m feeling better about the Batman after reading this. In Green Arrow Rebirth #1 [$2.99] by writer Benjamin Percy with art by Otto Schmidt, Green Arrow and Black Canary are exploring their mutual attraction. Some of the conversations between them, mostly about Oliver Queen’s wealth and self-proclaimed status as a social justice warrior, lands with loud clunks. The points are made, but the speeches are unnatural. 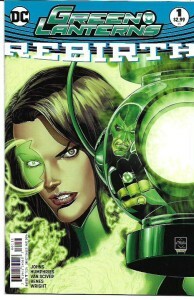 Green Lanterns Rebirth #1 [$2.99] by Johns and Sam Humphries with art by Van Sciver and Ed Benes focus on rookie lanterns Simon Baz and Jessica Cruz, who neither like nor trust one another. They are forced to work together by Hal Jordan. There’s also terrible menace growing beyond our planet. As is usually the case with me and the Green Lantern comics, I like the Earth stuff much better than the outer space or other universes stuff. Still, as with every Rebirth one-shot I’ve read, I find the characters and stories interesting enough that I want to see what happens next. Superman Rebirth #1 [$2.99] by “storytellers” Peter J. Tomasi and Patrick Gleason with art by Doug Mahnke (pencils) and Jaime Mendoza (inks) is a very human story of the Superman who came to Earth from a parallel universe with his family. In it, he helps Lana Lang give the recently deceased “New 52″ Superman a proper burial alongside Jonathan and Martha Kent. 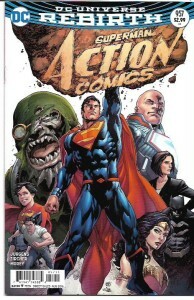 Meanwhile, we get another Superman in Action Comics #957 [$2.99] by writer Dan Jurgens with artist Patrick Zircher. It’s Lex Luthor in a super-suit. Which does not sit right with the Superman mentioned above. Oh, yeah, and there’s a new Clark Kent who doesn’t seem to be Superman and a new Doomsday, sporting his original “burlap sack” look. So, yes, I want to see what happens next. The Luthor of this comic book is more nuanced than many previous incarnations. I don’t trust him any more than the married Superman does, but decades of reading Superman comics have conditioned me to think of him as a stone villain. He may not be the Superman I want, but maybe he’s the Superman his city needs right now. In apology to the artists who worked on the above comics, I know I give them the short shift when I discuss the issues they’ve drawn. First and foremost, I’m a story guy. That said, all of the art in the above issues was at least good and some of it, like Zircher’s Action Comics, was amazing. There’s a full-page shot of Superman in the issue that should be a poster. I’m going to continue my examination of DC Universe Rebirth in my next column. See you then. 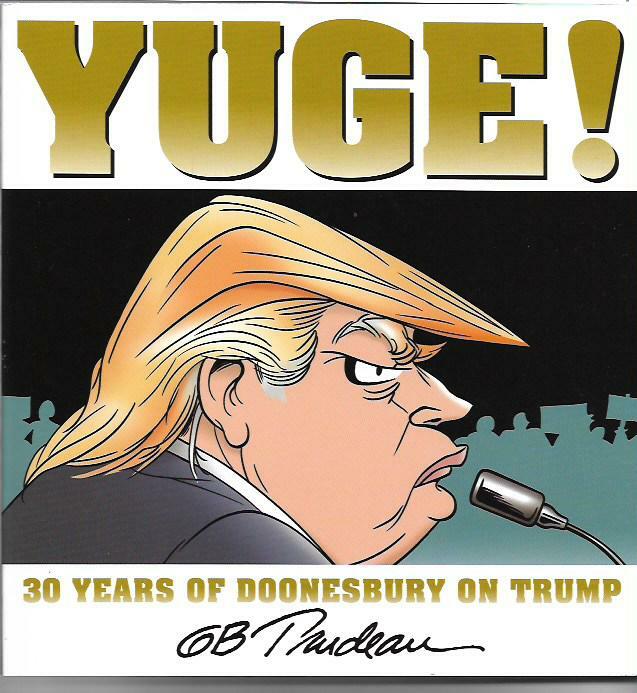 The back cover of this 112-page trade paperback features “Selected Comments from Donald Trump.” The comments start with “Doonesbury, Doonesbury! Everybody’s asking me to respond to Doonesbury! People tell me I should be flattered.” The comments conclude with “A total loser!” In between, we get comments that are positively benign when compared to Trump’s usual rhetoric. Trudeau’s interest in Trump started with the Donald’s first trial Presidential balloon in 1987. The cartoonist struck comedic goal, so he continued to use Trump from time to time. At one point, Uncle Duke, the former Rolling Stone writer kinda sorta based on Hunter S. Thompson, was Trump’s muscle and tasked with acquiring property from reluctant owners. While there’s nothing in this collection flattering to Trump, there are many of the keen satirical insights that made Doonesbury one of the finest comic strips of all time. As such, it’s a valuable book on multiple levels. First and foremost, it is a terrific gathering of great comic strips. It’s also a fine example of political satire in the comic strips. And it’s a reminder that we should have seen Trump coming a mile away. He was just waiting for the angriest and most intolerant of his fellow citizens to catch up with him. It’s said laughter is the best medicine. I hope that’s true because I’m feeling more than a little sick right now. Yuge! : 30 Years of Doonesbury on Trump is a remarkable collection. I recommend it to all. 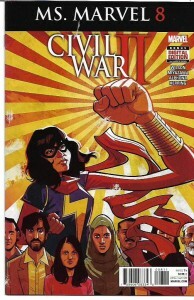 Ms. Marvel #5-8 [Marvel; $3.99] are, collectively, my pick of the week. I am also ready to officially declare that Ms. Marvel is my favorite Marvel title. If you’ve somehow managed to miss the generally positive press on this character, Kamala Khan is a teenage Muslim girl who lives in Jersey City. When she was exposed to the Inhumans’ Terrigen Mist, she got super-powers. She became a super-hero and, in short order, a member of the Avengers. What makes Kamala so delightful for me is how writer G. Willow Wilson manages to combine super-heroics with real-life issues and teen life. Kamala is stressed by the many facets of her life and the secrecy surrounding them. She feels the weight of family obligations just as strongly as those of her super-hero life. She experiences teen romance for the good and the bad. She tries to think before using her powers. She sometimes trusts authority figures too much. It’s a winning combination for me. In these most recent issues, Kamala’s stress levels have been off the charts with her brother’s marriage vying for her attention as she deals with school and super-hero stuff. She’s also had to deal with the first stages of Marvel’s latest crossover event: Civil War II. Which I’ll describe as briefly as possible. A new Inhuman has the power to rip off Minority Report. Excuse me, the power to see the future and, theoretically, prevent crimes and tragedies before they happen. Of course, this kind of sort of means the heroes who buy into this as a good thing will be arresting and otherwise violating the civil rights of individuals who have yet to commit an actual offense. Captain Marvel, who Kamala respects tremendously, is on the side of civil rights being too inconvenient to bother with. Kamala follows her lead, but quickly has doubts about the situation as she quite correctly compares this to racial profiling. Issue #8 brings this into focus with a dynamite last page that really does make me want to see what happens next. Ms. Marvel is available in several hardcovers and trade paperbacks. I recommend them all. It’s been a while since I’ve written about the Planet Comics books published by PS Artbooks of England. When last we spoke of them, I cautioned the initial years of this 1940s Fiction House title were mediocre at best. Sure, there were some ideas so bizarre that they were kind of fun. Sure, there was some of the early works of comics artist we now revere. But, all in all, these were not the cream of the comic-book crop. With Planet Comics Volume Eight [$59.95], we’re getting more good stuff that not-so-good stuff. 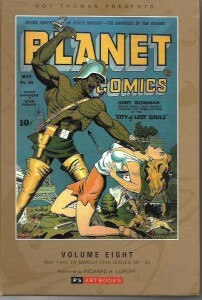 This hefty hardcover reprints Planet Comics #30-35 [May 1944 to March 1945]. The book also includes an informative intro by noted comic-book fan/historian and science-fiction author/fan Richard A. Lupoff. But, as always, the stories and art are the real draw. “The Lost World” is rolling along nicely. Hunt Bowman and his high-heel wearing friend Lyssa are surviving on an Earth devastated by an alien invasion and fighting the vile Volta Men. The adventures are entertaining with art by such notables as Graham Ingels before he was deemed “Ghastly” and Lily Renee. Artist Joe Doolin does fine work on “Mars, God of War.” The title character possesses the bodies of the human du jour – men and women – are uses them to foment war. The spectral sociopath is thwarted by a succession of brave men and women. In the last “Mars” story of this volume, he is opposed by the remarkable Mysta of the Moon. She will soon boot the God of War from his own feature. The wacky “Norge Benson,” which features a bear as the hero’s main sidekick, is also fun. Alas, this book reprints the last stories of the feature. The remaining series are basically assorted space cops and robbers. Some of the stories are good, some are mediocre, a few are simply awful. We don’t know who wrote the stories, but the artist roster includes Fran Hopper, George Tuska, Lee Elias and some of the first work of the legendary Murphy Anderson and Joe Kubert. These Planet Comics volumes – I’m running four or so volumes behind in reading them – won’t be for every comics reader. I get them for two reasons. First, I’ll purchase just about any reasonably-priced collection of comics from the 1940s or 1950s. Second, these books bring back fond memories of my late friend Dave Massaro, a gifted teacher who loaned me his original copies of Planet Comics issues because he thought they would inspire my own writing. I’m looking forward to reading the remaining volumes of Planet Comics. We will probably talk about them again. The Batman Adventures Volume 4 by Paul Dini, Brice Timm, Kelley Puckett, Mike Parobeck and others [DC Comics; $24.99] is my pick of the week this time around. Just as Batman: The Animated Series is my favorite movie or television incarnation of the legendary hero, the comic book based on that series is one of my all-time favorite Batman title. In the mid-1990s, when these stories first appeared, it was common for comics fans to deem the series the best current Batman title. 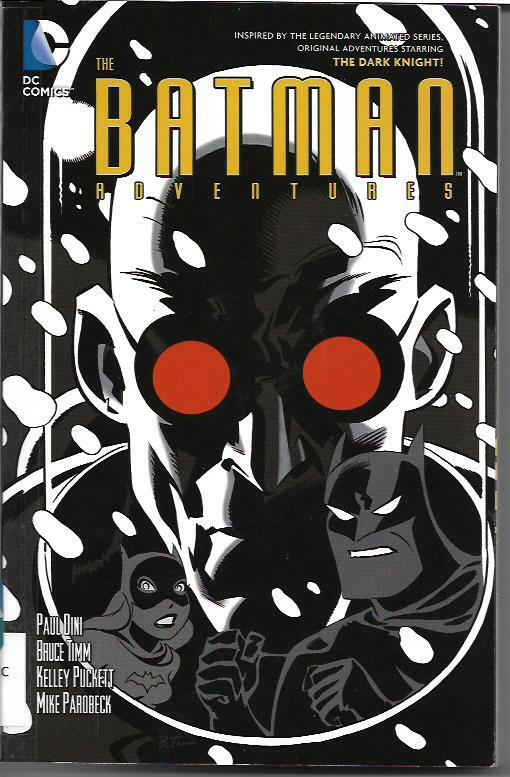 The Batman Adventures Holiday Special #1, which is included in its entirety in this volume, is a comics collaboration between writer Dini and other members of the animated show’s creative staff. The anthology features Batman, Batgirl, Clayface, Harley Quinn, Poison Ivy, Mr. Freeze, the Joker and Commissioner Gordon. Each short tale is complete unto itself with a satisfying ending. Especially choice are a melancholy Mr. Freeze story and an action-packed Joker tale. But there’s also much to be said for the sight of Harvey Bullock as Santa Claus and Renee Montoya as his elf. Puckett has several great stories in this trade paperback. One is an epic three-issue adventure in which Batman/Bruce loses all of his adult memories. Another is a wry comedy in which Mastermind and his two criminal compatriots are smack in the middle of a quest for a fantastic pearl. Ty Templeton pens a moving yarn of Bruce Wayne’s romance with a single mother that caught me smack dab in the heart. The collection concludes with a sprawling 44-page thriller in which the Batman joins forces with the Demon to stop Ra’s Al Ghul’s mad plan to wipe out most of humanity. This tribute to Jack Kirby was by Dini with co-plotters and artists Timm and Glen Murakami. This book is over 250 pages of some of the very best Batman comic books of the 1990s. The Batman Adventures Volume 4 is suitable for all ages. If you’re a Batman fan, a connoisseur of great comics, someone looking for a gift for a Batman fan, or, especially, the book buyer of a public or school library, you should buy this book. You should also buy a copy for yourself. Because you’ll want one. Buffy: The High School Years – Freaks & Geeks by Faith Erin Hicks with artist Yishan Li [Dark Horse Books; $10.99] takes us back to our stake-wielding heroine’s first year at Sunnydale High School in Hellmouth, er, I mean Sunnydale, California. To put it another way, this compact [80 pages, 6″ by 9″) graphic novel is set during the first season of Joss Whedon’s wonderful Buffy the Vampire Slayer TV series, which was must-watch television at my house. Hicks takes us back to when Buffy was still making the adjustment from most popular girl at her former high school to outsider at her school. Her friendships with Willow and Xander are still new, both for the Slayer and her friends. Her tutelage under Giles is just as new with the reserved watcher starting to become more than just her instructor in the ways of vampire-slaying. All of them have doubts about these new relationship, which Hicks uses to great effect in this story. Nerdy vampires. Four students who were abused in life and who are still dismissed by cool vampires in their undead existence. Just as desperate for attention as in their former lives, the four figure killing the Slayer will gain them immediate entrance to the coolest of the cool vampire ranks. They play on Buffy’s doubts, something common to high school students and, indeed, most of us throughout our lives. This adds the kind of emotional element to the vampire-slaying seen in the best episodes of the TV series and the best of the Buffy comic books over the years. The highest compliment I can pay Freaks & Geeks is that I could see it as a first-season episode of the TV series. It captures all of the angst and wonder of that first season. It feels like the show. It would have made for a memorable episode. This is the first book in a series of Buffy: The High School Years graphic album. Buffy: The High School Years- Glutton for Punishment [$10.99] by Kel McDonald and artist Li is scheduled for publication in November. I’m looking forward to it. Add Shigeru Mizuki’s Kitaro to the list of manga characters I love. Kitaro is a one-eyed boy with supernatural powers, the last living member of the Yurei Zoku. This “Ghost Tribe” used to roam our world until the growing numbers of humans chased them underground. But there are other creatures and ghosts bedeviling modern-day mankind. The answer to the question of who they gonna call when that happens is…Kitaro. 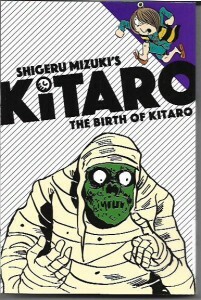 The Birth of Kitaro [Drawn and Quarterly; $12.95] is the first in a series of volumes reprinting the earliest Kitaro adventures from the 1960s. Mizuki draws on Japan’s countless legends of ghosts and other fearsome things for his stories, but the horror is lightened with humor and wacky characters. Neko Musume is a good example of those characters. He’s an unrepentant con man monster who is kind of sort of Kitaro’s friend. Kitaro also kind of sort of has more the one eye. His late father’s sentient eyeball lives in his son’s empty eye socket and often helps his son out of jams. Mizuki has a crisp to-the-point style in both his writing and his art. This first volume has seven done-in-one stories, the opening part of a prose feature on the history of Kitaro plus a section of “Yokei Files” on the things that dwell in Kitaro’s world. That’s a lot of fun and suitable-for-all-ages content. Kitaro Meets Nurarihyon, the second in this seven-volume series, will be published in October. If you read this first volume before then, you’ll be awaiting each and every volume as eagerly as do I. Tales of war and warriors are among the most fascinating, horrible and profound stories of the comics art form. When removed from the crass jingoistic tone that characterized the genre for much of its existence, such comics works can illuminate the human condition and draw readers into the experiences of the men and woman called upon to put their lives on the line for our lives or, far too often, for the economic or political desires of those who do not serve, have not served and will never serve their country and their fellows in this dangerous manner. If I seem to have climbed on to my soapbox, it’s because of this week’s pick of the week. A New York Times bestseller, Maximilian Uriarte’s The White Donkey: Terminal Lance [Little, Brown and Company; $25] is an emotionally-changed graphic novel about a young Marine who faces the horror and the mundane realities of serving in Iraq. Abe enlisted in the Corps in search of something missing from his life. What he finds comes at a terrible price. When I cite the emotional nature of this graphic novel, I refer to my emotions as I read it. I could feel the lump in my gut growing as I turned page after page. How can we put our young soldiers into situations like the then and now disaster that is the Middle East and do so again and again? How can we squander the potential of men and women who have so much to give our country in peace as well as in war? My jaw drops as Uriarte tells Abe’s story in crisp, to the point dialogue and drawings. There are more than a few moments that made me gasp or even choke as I read them. There were tears…for Abe, for his fellow soldiers, for my country. Uriarte is am Infantry Marine and Iraq veteran, who enlisted at 19. He served four years as a MRAP turret gunner and as a combat artist and photographer. He created Terminal Lance while still on active duty. The strip is published in the Marine Corps Times. The White Donkey is the first graphic novel of the Iraq War written and drawn by an actual veteran of the War. 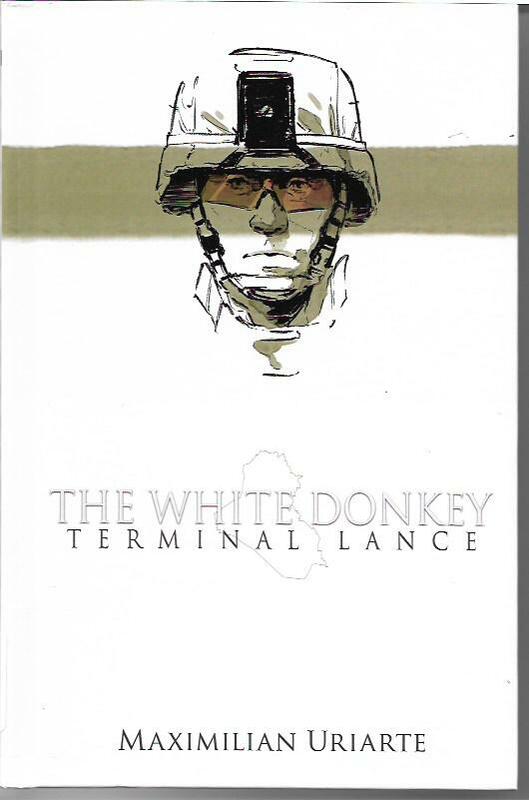 Released in April, The White Donkey: Terminal Lance deserves to be nominated for all applicable comics art and comics industry awards. It needs to be read…and not just by comics fans. Simply put, it is an unforgettable graphic novel. 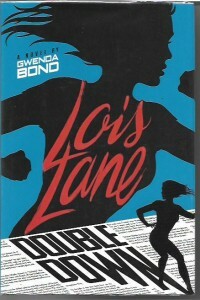 Lois Lane: Double Down is the second book in the young adult Lois Lane series by noted YA author Gwenda Bond [Switch Press; $16.95]. Weighing in at close to 400 pages, the novel is a solid thriller on every level. It has likeable characters, dastardly villains and a couple of players who fall somewhere in between. Even not so young adults – says the senior citizen reviewer – will enjoy it. I hope Bond is writing another Lois Lane book because she’s created an impressive Lois for modern readers. If she isn’t, I hope Switch Press has another writer lined up. This is a Lois Lane I definitely want to watch grow into the woman her fans have always known that she could be. I recommend this novel to Superman fans of all ages and genders. It’s a great read. One of my favorite current comic-book series is Postal, the ongoing Image title by Matt Hawkins and Bryan Hill and Isaac Goodhart. The series, which I’ve praised in the past, is set in the very odd town of Eden, Wyoming. When I learned Postal would be crossing over with two other series created by Matt Hawkins, I went in search of those earlier series. 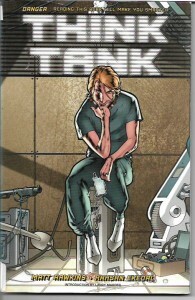 Think Tank Volume 1 by Hawkins and artist Rahsan Ekedal [$14.99] came out in December, 2012, but is still in print, Its protagonist is David Loren, a genius recruited by the government when he was a teen. He’s the smartest scientist in the military think tank where he lives, but he’s grown increasingly opposed to the military using his creations for killing. Loren wants out. David is MacGyver on super-science brain steroids. His success rate is higher than any other scientist in the think tank and would be even higher if he weren’t withholding some of his successes. But he’s considered such a high-value government asset the military would be willing to stick him in a dark hole or even terminate him to keep him from taking his talents elsewhere. That’s a challenge David can’t resist. What follows is a fast-moving and very smart story. 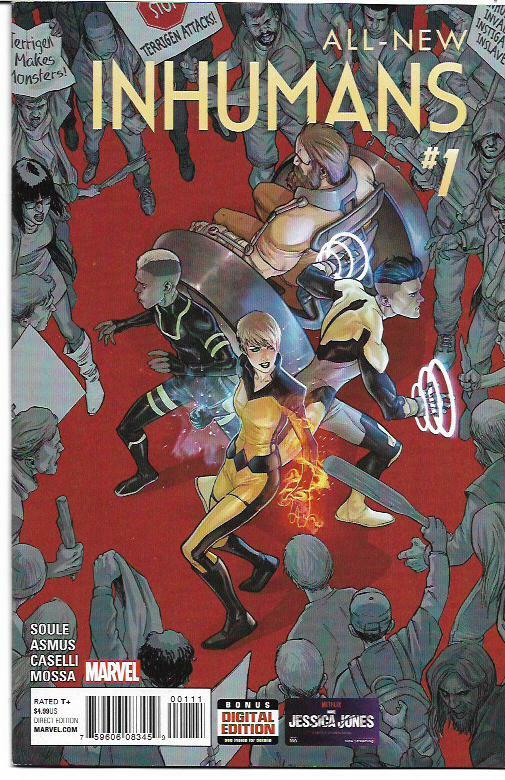 Even the more outlandish science stuff seems completely implausible within this collection of Think Tank #1-4. The story itself is reason enough to seek out this book, but the bonus features add considerable value to the collection: a cover gallery, the fascinating “Science Class” columns and previews of two other Image series, Echoes and Sunset. I’ve ordered both. Think Tank Volume 2 is also on its way to me, but I couldn’t wait to let my Tips readers know how much I enjoyed the first volume in the series. For me, Hawkins has become a writer worth seeking out. I’m sure I’ll be writing about his other work in the future. In the meantime, check out Postal and Think Tank. Hero Comics [IDW; $19.99] is an anthology of comics stories and art created to benefit the Hero Initiative, an non-profit organization, which, in turn, gives financial and other help when comics creators are in dire need of assistance. While the Comic Book Legal Defense gets more donations and press – and does good work protecting the First Amendment rights of cartoonists and other creators – it’s the Hero Initiative that speaks more deeply to me. The Hero Initiative treats the comics creators it helps with great respect, as well they should. Many of those they have assisted are the very writers and artists who inspired subsequent generations of creators. Increasingly, those in need of their help are creators of my own generation and those that followed us. These are my people and I love Hero for having their backs. That great respect I mention includes respecting the privacy of the creators helped by the Initiative. This is one reason why the fans don’t always realize how much good work Hero does. Confidentiality does not get headlines in the comics press. While some comics creators don’t want their circumstances revealed, others have come forward to become champions of the Hero Initiative and their fellow comics creators. Mike Grell wrote the introduction to this collection. Russ Heath contributes a poignant single-page comics story that encompasses how comics artists have not received fame and appropriate fortune for their work and how a simple act of kindness, giving Heath a bottle of wine along with the more vital help he needed, can foster self-esteem in creators beaten down by the industry. Not that tough guys like Russ and my friend Mike are ever beaten down. So here we have this benefit book. It is 120 pages of outstanding comics creativity by the likes of Howard Chaykin, David Lloyd, Bill Willingham, Neil Gaiman, Mike Dringenberg, Sam Kieth, John Layman, Richard Starkings, Kevin Eastman, Kurt Busiek, Dave Sim, Gene Ha, Gerry Conway, Phil Hester, Mark Stegbauer, Bill Messner-Loebs, J. Scott Campbell, Ralph Reese and many others. These are stories and images that tugged at my heart, contributions from those who are no longer with us: Josh Medors, Gene Colan, Darwyn Cooke, Dave Simons, Alan Kupperberg, Stan Goldberg and Robert Washington. These are my people. They will always be my people. Hero Comics is my pick of the week. When you buy it, you’re helping comics creators. I urge you to buy this book, to become a member of the Hero Initiative and to donate as generously to the organization as your own circumstances allow. You can be a hero, too. DC’s Superman Adventures was set in the continuity of Superman: The Animated Series. It ran for 66 issues from 1996 to 2002. It was a companion title to The Batman Adventures and Justice League titles, also based on animated series. DC has started reissuing the trade paperbacks collecting these stories. Superman Adventures Volume 2 [$19.99] is the latest reissue. 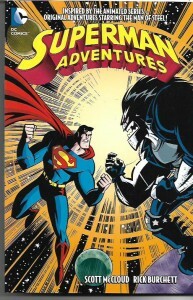 This book collects Superman Adventures #11-16, Superman Adventures Annual #1 and Superman Adventures Special #1. The writers line-up is impressive: Scott McCloud, Mark Evanier, Mark Miller, Hilary J. Bader and David Michelinie. Likewise the pencilers and inkers: Rick Burchett, Neil Vokes, Joe Staton, Terry Austin and others. Not one of these suitable-for-all-ages tales is less than entertaining and most are far more than that. There’s no writing down to a young audience in this book. McCloud kicks things off with a two-issue story about a dying Superman and the world’s attempt to save him, then follows that with a clever, funny tale about aliens challenging Superman to a sporting contest. Evanier draws a contrast between traditional print journalism and modern media that also shows their similarities. His second story in the book features the always-fun Bibbo. I loved the Superman cartoons this comics series drew its tone from and I love these comic books. 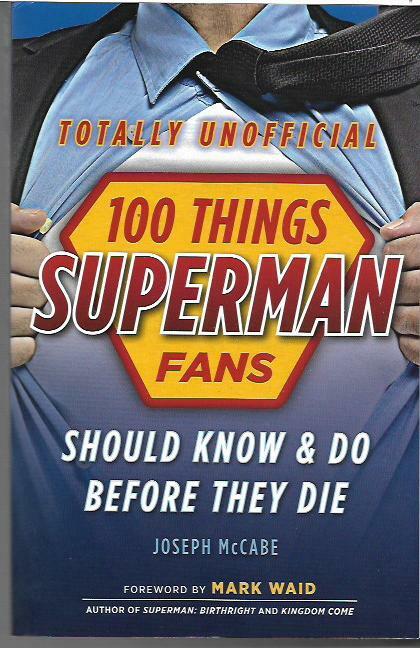 They would make wonderful gifts for the young and the old Superman fans in your lives. I’ve been re-reading Stan Sakai’s Usagi Yojimbo from the start of that exceptional comics series, but I’m also reading new issues as they are published. There is no such thing as too much Sakai. 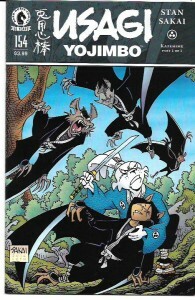 Usagi Yojimbo #154 [Dark Horse; $3.99] is a done-in-one adventure. “Kazehime” is a bat-like ninja whose life Usagi saves. Her clan of ninjas has featured prominently in other tales. When our wandering samurai’s journey leads him to a job protecting a merchant, he once again crosses path with her. The issue is completely accessible to new readers. The inside front cover gives sufficient background to Usagi’s world and situation. Sakai’s clear storytelling, both in the writing and in expressive black-and-white art, bring a reader into the story and keeps them there. Besides Kazehime, we also meet sword-for-hire Yamaguchi, who was on the opposite side from Usagi when they met years ago. Yamaguchi commands the merchant’s less-than-professional guards. He recruits Usagi so he can have at least one dependable sword at his side. He is an interesting character who works well with Usagi. Sakai delivers a fine story with a satisfying conclusion. It’s one more reason Usagi Yojimbo has been and remains one of the very best comic books being published today. My July weekends are going to be busy and fun. I’m attending three conventions in as many weekends. First up is G-Fest, the annual Godzilla convention held in Chicago. I’ll be doing a “Kaiju in the Comics” presentation at this event, showcasing giant monsters in said comics. This convention will take place on July 15-17. PulpFest is devoted to pulp magazines like Doc Savage, The Shadow and many others. It takes place July 22-24 in Columbus, Ohio. I’m not a featured guest at this convention. I go there to see old pals I don’t see anywhere else. My July schedule wraps up with Monsteramafest, a brand-new event in Akron, Ohio. Put on by the same folks who do the wonderful Akron Comic-Con, it will take place on July 30-31. I’ll be appearing on a panel devoted to Cleveland’s own Ghoulardi (Ernie Anderson), the monster-movie host who ruled Cleveland when I was a kid. I love to see my readers at these and other events. If you are at the same convention as me, don’t be shy about coming over to chat with me. I enjoy that a great deal. 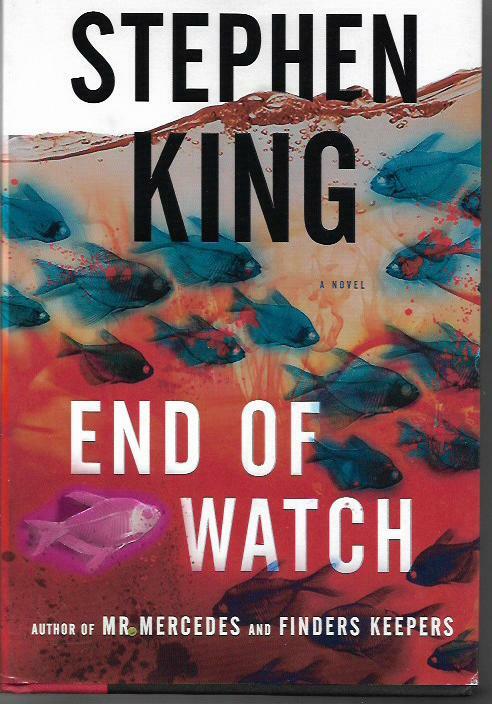 End of Watch is the finale of King’s Bill Hodges trilogy. Hodges is the retired police detective we met in Mr. Mercedes (2014). He is haunted by his most infamous unsolved case, the slaughter of people waiting in line at an early-morning job fair. Their killer ran them over in a stolen Mercedes and then drove the woman whose Mercedes he stole to suicide. The killer – Brady Hartsfield – is a computer genius and a sociopath. Brady’s mistake is when he tries and fails to drive Hodges to suicide as well. He compounds that by trying and failing to kill Hodges, by accidently killing his own mother and by trying to go out with a suicide bomber bang at a concert. Hodges and his “team” – Holly Gibney, the niece of one of Brady’s victims, and Jerome Robinson, a young friend – prevent Brady from carrying out this massacre. Holly prevents the heck out of it by clobbering Hartsfield with her laptop until Brady’s brains are mush. The mad killer ends up in a coma and an institution. Finders Keepers (2015) has Bill working as a private investigator with Holly and Jerome at his side. In this second book, the big bad is an obsessive fan who murdered a reclusive writer and, 35 years later, is seeking that writer’s lost notebooks. Hartsfield is not a major player in this novel, but King features him and reveals Mr. Mercedes isn’t quite as brain-damaged as we thought. In End of Watch, Bill’s health is failing, though he tries to hide this from Holly. Meanwhile, an egotistical, immoral neurologist has used Brady as a test subject for experimental drugs. The treatment gives Brady the ability to act despite his ruined body. He’s going after those teens he failed to kill at the concert…and he’s going after Bill Hodges and his team. Which is as specific as I’m going to get here. End of Watch is as riveting as the best King novels. Hodges, Holly and Jerome are heroic, likeable and relatable characters. Pete Huntley, Bill’s former partner on the force, is a solid supporting player. Pete’s new partner is a detective more focused on advancing her career than doing her job. And Brady? He is a scary, venomous villain. The kind you love to hate. End of Watch delivers heart-stopping thrills and horrific moments. Most importantly, it delivers a satisfying ending that feels right. Not only does King still have it, he’s never lost it. I will keep reading his books as long as he keeps writing them. 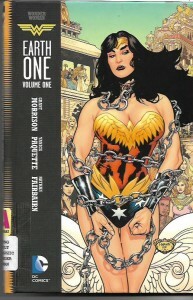 Wonder Woman: Earth One Volume One by Grant Morrison with artist Yanick Paquette and colorist Nathan Fairbairn [DC; $22.99] is the latest in the series that has seen modern-day reinterpretations of Superman, Batman and the Teen Titans. Some of those graphic novels have been brilliant, some less so. This one isn’t brilliant, but it is a solid and solidly entertaining work. Morrison never soft-pedals either the oppression of the Amazons by abusive men or the lesbianism that naturally results as the warrior woman create their own island society. Paquette with his drawings and Fairbairn with his colors draw a sharp contrast between those two states of existence. The oppression is hard to take, the island is wondrously uplifting despite the secret dishonesty which lies at the heart of Princess Diana’s birth. Morrison’s reinvention of Steve Trevor as a man of color who sees the parallels between Amazon and American history re: slavery and other deprivations and deceits. Etta Candy is gloriously reinvented as a unabashed bisexual whose confidence and joy of self is simply delightful. I love her and I love this graphic novel. I highly recommend this graphic novel. You will read it and love it and then join me in anxiously awaiting Volume Two. 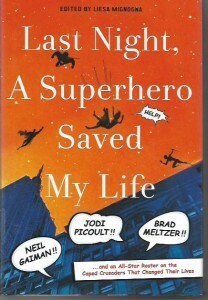 Edited by Liesa Mignogna, Last Night, a Superhero Saved My Life: Neil Gaiman!! Jodi Picoult!! Brad Meltzer! !…and an All-Star Roster on the Caped Crusaders That Changed Their Lives [Thomas Dunne Books; $25.99] is a collection of articles by authors about the comic-book heroes with whom they connected in a formative way. Those of us in the comics industry whose creative bent is to honor the essentially optimistic nature of the super-hero genre have long understood the power of our work to change lives for the better. More than I can express, I cherish the communications from readers who have told me they became teachers because of Black Lightning or found a key to strengthening their relationships in a scene I wrote decades ago. If you want to take the above as my disdain for comics creators and publishers who use super-heroes to act out their own darkest desires, feel free. They are damaged individuals incapable of appreciating or understanding the joy of the genre. Back on point, Last Night is the mixed bag you’d expect from such an anthology of stories from diverse creators. A couple of them are pretentious and virtually unreadable. Most are intriguing. A few of them will touch your hearts and souls. Among the latter were the contributions from Delilah S. Dawson, Anthony Breznican, Alethea Kontis, editor Mignogna, and the three pieces on Wonder Woman from Carrie Vaughn, Leigh Bardugo and Jodi Picoult. There’s a lot more good than bad in Last Night and a fair share of great. I recommend it to readers whose interest in comic books extends beyond just the comic books themselves. The Complete Peanuts 1999-2000 by Charles M. Schulz [Fantagraphics; $29.99] is my pick of the week. This 25th and final volume in the series collects the final thirteen-and-a-half months of the strip that redefined comic strips with its 1950 debut and continued to be a joy to its devoted readers and an inspiration to cartoonists all over the world for half a century. Indeed, since Peanuts reprints still run in many newspapers, the strip has continued to bring joy and inspiration in the 15 years since its creator’s death. To me, Peanuts is always of the now. Even though I knew these were the concluding strips, I was still caught by surprise when I came to the last ones. Probably because Peanuts isn’t really gone and it will never be really gone. We can all still recall that one special strip or sequence that spoke to us so truly. We can close our eyes and see Charlie Brown and Snoopy and all our friends. Adults that we have become – and how the heck did that happen? – if we tried to speak to them, they would hear nothing more than bleating trumpets. Yet, magically, wonderfully, we can still hear them. Also included in the book is the complete Li’l Folks feature Schulz did before he did Peanuts. This was a weekly feature consisting of three or four gag cartoons featuring a continuing cast of children (and a dog) not unlike Charlie Brown and his gang. Indeed, one of the kids is even named Charlie Brown. There were 138 installments of this feature, the building blocks of the international sensation that Peanuts would become. Founded in 1976, Fantagraphics has published a stunning library of comics and books of all kinds and for all sensibilities. I couldn’t even begin to estimate how many of their books I have enjoyed and own. If I ever organized my Vast Accumulation of Stuff and go from boxes to bookshelves, it would not surprise to find a bookcase or two or three filled with Fantagraphics volumes. But, of all those amazing books, none of them have filled me with more sheer delight than their Peanuts collections. And, when I reach that far off day when I locate all of my Peanuts volumes and have them in one place, I’m going to read them again from start to finish. Schulz is an American treasure. 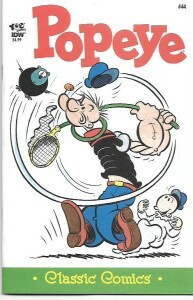 Fantagraphics deserves considerable praise for preserving his great achievement. Every public library, every school library, even comics reader’s library should include these books. They are golden dreams. 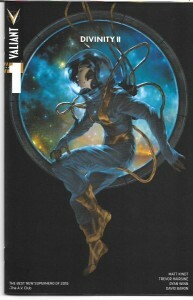 The Valiant Universe again reaches into the Unknown for Divinity II [$3.99 per issue] by writer Matt Kindt with artists Trevor Hairsine (pencils), Ryan Winn (inks) and David Baron (colors). In the first series, we learned how Russian cosmonaut Abram Adams and two of his fellow cosmonauts were sent deeper into space than anyone before. They met something Unknown. That contact changed Adams and gave him unimaginable powers. He became Divinity. There was the expected clash with the forces of the West. It was a violent clash. Divinity won. Then he retreated into a reality that he created for himself. Those few humans who knew of his incredible power breathed a fleeting sigh of relief. In this new series, Myshka, one of the other Cold War cosmonauts on that distant mission, has returned to Earth. With the same powers as Adams and no reluctance about using them in the service of her vision of Mother Russia and in her quest for vengeance towards the man who abandoned her in space. It’s on. I’ve read the first two issues of this second series and there are seriously frightening moments in them. Myshka herself is as scary a villain as I’ve seen in the Valiant Universe and that is saying something. I can’t wait to see what happens next. What you can expect from this series is fine writing that is also friendly to new readers. Even if you didn’t read the first series, Kindt and a concise “what has gone before” page will bring you into the ongoing adventure. Hairsine’s drawing and visual storytelling are first-rate, full of dynamic action and gripping emotion. Winn and Baron tie it all together with excellent inking and color work. This is a darn good comic-book series. Divinity collects the first four-issue series in a 112-page, full-color trade paperback. Divinity II will be published in September. I recommend both. I wasn’t expecting much from Hyperion #1-2 [Marvel; $3.99 each) by Chuck Wendig with artist Nik Virella. It’s a spinoff from the new Squadron Supreme series and I can’t say I’m a huge fan of that one. While SS has interesting concepts, it started out with the kind of cheap shock tactic on which too many super-hero titles have come to rely. The shock was accompanied by a Marvel executive’s apparent glee over the decapitation of a Marvel Universe icon, which further pushed me from any regard for Squadron Supreme. Some people should not to get to play with other people’s toys. 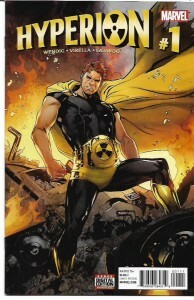 Strike three came from this Hyperion incarnation being created by Jonathan Hickman, who has worked his way onto my no buy/no read list. That said, I’m intrigued by the notion of a super-hero taking some time off to contemplate the violence, including committing murder, of his life while questioning what kind of hero he wants to be and even if he wants to be a hero. This Hyperion is still an arrogant and callous jerk, but I give him points for considering a different and perhaps better way. Two issues haven’t been enough for me to decide if I like this new series. I know I like some things in it, first and foremost among them a young runaway named Doll who has the power to nag Hyperion into occasionally doing the right thing. I like enough about this comic book to keep reading it for now. Politics is the theme of this week’s column. Trigger words will be kept to a minimum. I thoroughly enjoyed All-New Inhumans #1-6 [Marvel; $4.99 for the first issue, $3.99 for the rest] by James Asmus and Charles Soule with artists Stefano Caselli and Andre Lima Araujo and colorist Andres Mossa. The new series is as much an international political thriller as it is super-hero adventure. Black Bolt blew up the Inhuman home city of Attilan, releasing big whomping clouds of mutagenic Terrigan Mist into Earth’s atmosphere. The Mist triggers changes in humans who have Inhuman DNA in their makeup. Black Bolt did to this to save the planet, which must have seemed like a good idea at the time. Medusa now rules the Inhumans and, with sister Crystal, is trying to help these new Inhumans adjust to their powers and find a place in the world. This title focuses on Crystal, an ambassador flying all over the globe in the humongous Royal Inhuman Vessel. The sight of this giant ship doesn’t always inspire confidence on account of it’s pretty darn frightening. I love the international politics angle of this series and how the Inhumans act as a sovereign nation trying to work with their fellow nations for the common good and, especially, for the good of those new Inhumans. Crystal is quite the diplomat, but her priorities are with her own people. By turns, she can be compassionate, heroic, duplicitous and manipulative. With the Alpha Primitives seemingly absent from the mix, I’m finding myself interested in the Inhumans for the first time in a long time, though some credit must also go to Marvel’s Agents of SHIELD television show. Crystal is the star of All-New Inhumans, but I also love Gorgon’s new role. Crippled in some adventure I never read, he is Crystal’s good right hand, a teacher of the young and a warrior not bound by his physical limitations. I’ve always thought of him as just sort of there in the background, but he’s really coming into his own in the book. Add a number of other intriguing and likeable supporting cast members to the mix and you have a great series. It hurts my brain to try to suss out the continuity of the Marvel (or the DC) Universe. I prefer titles which can be enjoyed without overt ties to a dozen other titles. All-New Inhumans is that kind of series. What readers need to know about the larger universe in which it takes place is so smoothly included in dialogue that it’s hardly noticeable. Well done, Asmus and Soule. The first four issues and an introductory story have been collected in All-New Inhumans Vol. 1: Global Outreach [$15.99]. I recommend it and the ongoing title. My friend Nat Gertler is well-known as a Peanuts expert. However, as the owner and publisher of About Comics, he’s also known for his eclectic, interesting and handsomely made books. Recently, he has delved into “political entertainment,” restoring and republishing material that has been out of print for decades. 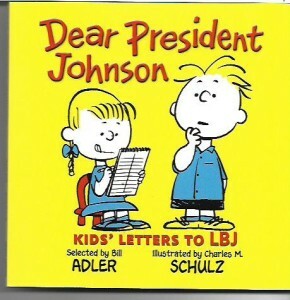 Dear President Johnson: Kids’ Letters to LBJ [$9.99} is a compact mix of Peanuts and politics of the most innocent kind. Originally published in 1964, the book gathers unbearable cute and devilishly funny notes sent to then-president Lyndon Johnson by children with illustrations by Peanuts creator Charles M. Schultz. Adler was an author, editor and compiler. In his obituary, the New York Times said he “pursued his goal of being the P. T. Barnum of books by conceptualizing, writing, editing, compiling and hustling hundreds of them — prompting one magazine to anoint him “the most fevered mind” in publishing.” He died in 2014. With the cooperation of LBJ’s White House staff, Adler selected 64 letters to be included in this book. There are requests for badges and other items. There are invitations to Boy Scout meetings and a lunch at one young writer’s school. The child says his mother will make extra tuna fish sandwiches for the President and his wife Lady Bird. There are compliments and heartfelt suggestions. Because I sometimes have the mind of a 12-year-old, my favorite of these missives is the one in which fourth-graders from Chicago want to know the size of the President’s hand. They are creating units of measure and want to measure the circumferences of their desktops in “Johnsons.” Yes, I am ashamed of myself for loving this letter as much as I do. Dear President Johnson is a fun look back at history seen through humor. 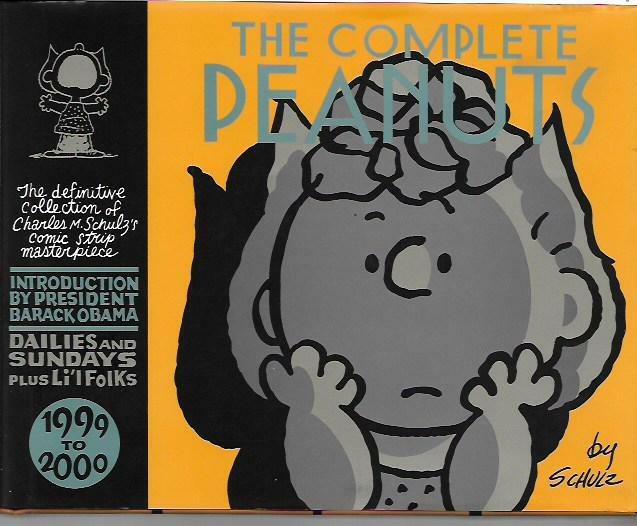 It would be a great gift for folks who collected political artifacts and for Peanuts fans. It came within a hair of being this week’s pick of the week. My pick of the week is another About Comics publication. 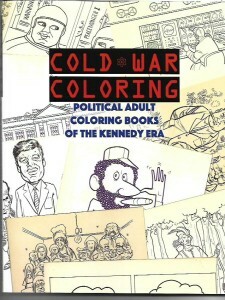 Cold War Coloring: Political Adult Coloring Books of the Kennedy Era [$9.99] collects and reprints five such books. The foreword and individual introductions to each books place them in the context of the era, providing a leg-up to readers who may not have been born when these coloring books were first published. The first adult coloring book seems to be the Executive Coloring Book, published in 1961. The second one was the JFK Coloring Book, which leads off this collection. The book, conceived by Alexander A. Roman purports to be written by the young Caroline Kennedy. The copy is actually written by the prolific Paul Laikin, who I think wrote for every humor magazine of the 1950s through the 1980s. The illustrations are by MAD superstar Mort Drucker. It’s an amusing, charming book and more concerned with the nation’s fascination with than the politics of the moment. It’s wonderful. The New Frontier Coloring Book is from 1962. Published by the son of a Republican senator, its snide tone will be familiar to those who follow current right-wing political cartoons. It’s anti-Kennedy with little to no regard for facts or reason. The art is as week as the writing with mediocre caricatures repeated over and over again. Still, I applaud About Comics for balancing this book between the two American parties. The Nikita Sergeyevich Khrushchev Coloring Book (1962) was written by Amram Ducovny, the father of X-Files star David Duchovny. Don’t ask me to explain the spelling discrepancy of the last names. This coloring book is kind of funny, though it takes its cues from cold war propaganda. The Ken Nunes and Adrien Prober drawings are lively but not quite polished. Khrushchev’s Top Secret Coloring Book (1962) is much more fun. It was conceived and written by Gene Shalit and drawn by the legendary Jack Davis. Of the coloring books included in this book, this one is the best drawn and the wittiest. The John Birch [Society] Coloring Book (1962) is a fair but biting poke at the paranoia which characterized that group. The John Birch Society saw Communists and a One World Government everywhere that it looked. Mocking them was too easy then and it’s too easy today. This one was created by Martin Cohen and Dennis Altman, two of the creators of the Executive Coloring Book, and Robert Natkin. Overall, Cold War Coloring is a remarkable volume. It reminds me of an era I barely understood as a child and clarify those times for me. It’s a perfect gift for coloring book buffs, nostalgia fans and political memorabilia collectors. About Comics will be publishing additional “Presidential Bookshelf” volumes. I await them eagerly. My next convention appearance will be at Indy Pop Con, June 17- 19 at the Indiana Convention Center in Indianapolis. But I’ll be back here next week with more reviews. Cartoonist Lucy Knisley is a national treasure. If you need proof of that, you need only read her newest work. 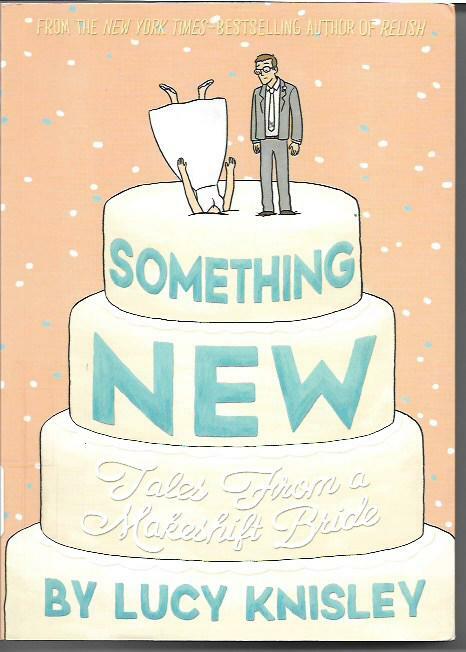 Something New [First Second; $19.99] is a nearly 300-page graphic autobiography charting Knisley’s journey to marriage. Three years after Knisley broke with her boyfriend, John came back into her life and proposed. That which had divided them had ceased to be issues. To me, Lucy and John had clearly been “the one” for each other and, if that was all this book was about, it would still have been an entertaining romance tale. But, instead, Knisley has written a delightful hilarious, honest and sometimes frightening exploration of two outside-of-the-box lovers facing one of the most cherished institutions in our culture and finding a way to make it (mostly) their own. Something New takes readers along each step of the way in easy-to-digest chapters. The sheer amount of human interactions and useful information in each chapter is staggering, especially considering the amazing addendums/epilogues to each chapter. Just forget about saying yes to the dress. Lucy and Jon should be the stars of a TV show looking at their wedding and then getting involved with other weddings. I’d watch that show in a heartbeat. True confession. I cry at weddings. I’m not obvious about it or, at least, I don’t think I’m obvious about it. But I tear up at these things because the union of two people is either a beautiful thing or a horror waiting to be unleashed on the unsuspecting bride and groom. I’m 32 years into my wonderful marriage so I’m always hoping for the best at these things. So, yes, I got a little teary at various times while reading this book. Sometimes Lucy or John would do something so wondrous that I shed a tear of joy. Sometimes I felt the sting of frustration when things didn’t do quite so well. Overall, I smile and laughed a lot more than I got all misty-eyed. This is a funny and life-affirming graphic autobiography. It’s my pick of the week and – say it with me – should be in every public and school library and in the home library of every true devotee of the comics art form. I’m ordering some extra copies to give out as gifts. The CW’s Arrow is one of my favorite TV series, something it shares with both DC’s and Marvel’s comics-inspired shows. However, it was just recently that I first read any of the short Arrow comic-book-style stories posted online and in various print editions. I liked what I read. Arrow Volume One [DC Comics; $16.99] features nineteen short comics stories by a variety of writers and artists, among them the show’s executive producers Marc Guggenheim and Andrew Kreisberg, and Mike Grell, the legendary creator whose Green Arrow work is the standard by which other interpretations are weighed. This first volume was published in 2013 and has had additional printings since then. These stories take place around the televised episodes. They add to those episodes and reveal background and other secrets only hinted at in those episodes. Each story is ten pages long and manages to tell a complete and satisfying tale in those ten pages. There have been times when I have felt such compact storytelling was a skill lost to the comics ages. I’m pleased to see it is still practiced. I don’t know if I’d classified any of the stories as great per se, but they are all entertaining and well done. The stories were done by many writers and artists, but every character is in character, and the visuals retain the action, drama and realism of the show. That’s impressive for stories of this length. There have been three volumes of these Arrow comics stories. I plan to read the other two as soon as possible. While Scooby-Do! Team-Up isn’t the weirdest take on the classic and beloved cartoon – I’m thinking DC’s forthcoming Scooby Apocalypse wins that “honor: hands down – it’s still pretty far out there. 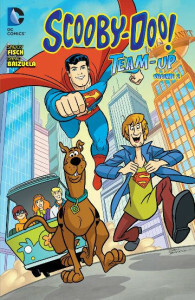 But I read Scooby-Doo Team-Up Volume 2 by Sholly Fisch and artist Dario Brizuela [DC; $12.99] last week and it just plain tickled me. Scooby and his meddling kids go back into the past for a hilarious visit with the Flintstones, then go into the future to team up with the Jetsons. There are also adventures with Superman, Jonny Quest and Secret Squirrel and a spooky crime caper with Harley Quinn and Poison Ivy. Fisch’s stories are clever and very funny with enough meta jokes to please my inner fan. The art by Brizuela and Scott Jeralds is lively in design and sure-handed in the storytelling. The original cartoons should only have looked and moved this well. Scooby-Doo! Team-Up is good fun for all ages. There have been two volumes to date and I hope more are coming.